How can moving your body teach you to be brave? I have grown into being a person who uses their whole body to communicate. I talk with my hands, I jump up and down when I’m ecstatic, I grab my feet when I’m overwhelmed, I utilize as much of my body as possible to express what’s going on. This is what I bring to my classes. I’ve worked with a wide age range of students, but no matter the age I find it’s important to attempt to get them out of their heads and into their bodies, their whole bodies. “Be Big and Bold” is the first thing I ask of all my students. I ask them to do this as I stand in front of them, their faces unfamiliar to me, stretching my body as wide, tall, and weird as it can go. I try my best to physicalize the idea of being big and bold. Usually I elicit laughter and smiles, but I constantly remind my students to be brave in my class by using the movement of my own body. 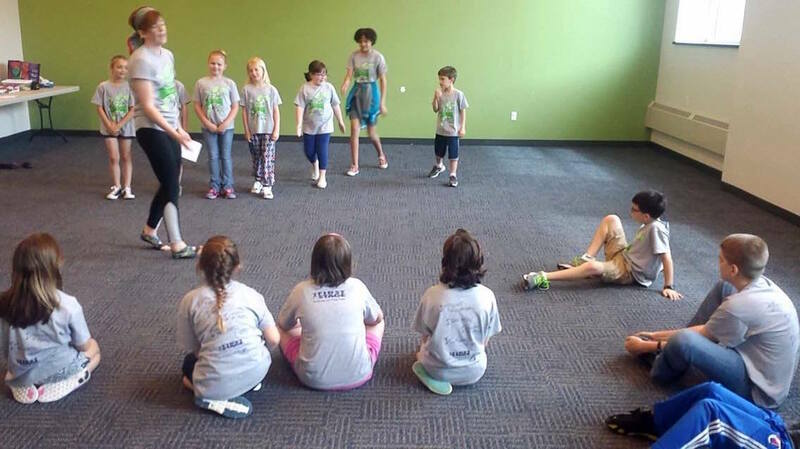 I currently live in Milwaukee, WI and have spent the last few years working with First Stage Theater Academy. The focus of First Stage is to teach Life Skills through Stage Skills, which is how my “Be Big and Bold” classroom rule came into existence. 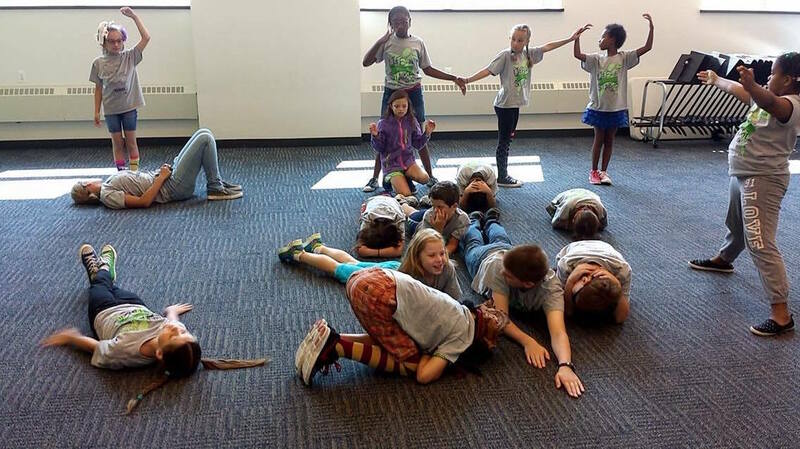 Last summer I spent 8 weeks teaching a Voice and Movement class with 3rd and 4th graders. Each group of students spent 1- 2 weeks with me, culminating in a class presentation for their family and friends. My classes were approximately 90 minutes in length and most days my students spent over half of that time doing some form of movement. Every day we began class with a short yoga routine to warm-up and bring our focus to the room, our classmates, and ourselves. We then would proceed with a variety of activities involving our bodies and voices that focused on building teamwork and, ultimately, confidence. The beginning of the week is always filled with hesitant movements, quiet voices, and a never-ending amount of questions. These are the moments where I remind my students of the “Be big and bold” idea. I ask them to exaggerate their physical choices, I applaud the moments they step out of their comfort zone, and emphasize that in my class there is no wrong answer to what I am asking them to do. Quickly, we reach the end of the week where I need all the teamwork and bravery they can muster. I hand small groups in each class the poem “Where the Sidewalk Ends” by Shel Silverstein and ask them to work together to create a vocal and physical representation of the poem. This end result was one of my goals throughout all of my classes: to get students making bold choices without judgment. To me, this is what it is to be brave. As adults we begin to judge and overthink our actions, we get buried in our own heads and hesitate. By having students focus on their bodies throughout a variety of activities I found they began to get out of their heads and lose their initial hesitation. They asked less questions about activities and started jumping in. As they made bigger and bolder choices with their bodies you could see their confidence rising. In order to be bold and silly with your body you have to feel comfortable to take up space in a room. In order to feel comfortable taking up space you have to believe you are worth that space. I want to instill in younger generations that they are worth that space and by realizing that at a young age I hope they can carry a willingness to be brave throughout their lives. Hayley Cotton is a teaching artist and actor currently living in Boulder, CO. She received her B.A. in Theatre Arts from the University of Wisconsin-Parkside and is currently working on her M.A. in Theatre Education at the University of Northern-Colorado. She has worked professionally for California Shakespeare Theatre, CLIMB Theatre, First Stage Children's Theatre, and the Milwaukee Repertory Theatre. Her work focuses primarily on the power of using theatre as a teaching tool for life skills such as confidence, teamwork, and focus.